In late May I had the amazing opportunity to go to Singapore for a few days to participate in the Asian Festival of Children's Content. I was excited to get to add yet another country to the list of countries I've been able to visit. At my previous job I knew bright students who studied in Singapore, so I've wanted to go and see what makes this country have such a good international reputation. So yes, my camera really liked everything it saw and was able to capture in Singapore, but probably my favorite thing about my time there was that I got to meet, for the first time, some bloggers that I have been talking to for years! Bloggers like Liyana of LiyanaLand and Tarie of Asia in the Heart, World on the Mind encouraged me and inspired my blogging back in my early days, reminding me with their mere presence to keep the importance of diversity in mind as I blogged about YA lit. And what would a Singapore blogger meet-up be without mentioning Chachic, with whom I've exchanged countless postcards and whose unabashed enthusiasm for her obsessions is infectious? Chachic, Tarie, and I (we're sorry you couldn't make it, Liyana!) met up in a giant mall on Orchard Rd. for a blogger girls night out, where we got plastered and danced with hunky men in themed clubs until dawn. No, actually, we just ate cupcakes. But they were VERY GOOD CUPCAKES. Thanks, Chachic, for introducing us to them! Chachic showing off the cupcakes! It was great fun hanging out with these incredible ladies, and I would love to do it again. My tastes of Southeast Asia so far (Singapore, Malaysia, hearing about Manila from Tarie) have only made me want to explore it more. Next year la! I Have a Travel Blog! Well, thanks to your overwhelming support of my starting a travel blog, I took some time these past few days and created one! Do you want to know what it's called and where to find it? I'm sure you have many questions. What's going to be on the blog? Why did I switch from Blogger to Wordpress and have no regrets about it? What does the name mean? Why did I spell it "Litres" instead of "Liters"? Oh, and will there be many, many pictures? Visit my travel blog, and your questions will be answered. (Except for maybe the Wordpress one. Simply put, Wordpress is wonderfully intuitive and effortless to use.) There will be stories. There will be pictures. There will be posts about what Chinese sleeper trains are like. That's all for now. Thanks for reading and sticking with me! When a strange caller informs young pianist Kiri Byrd he has the remains of her dead sister’s stuff—a sister who had been dead for years—Kiri’s life turns upside down. Kiri struggles to piece together what she’s learning about her sister, but doing so sets her on a crash course towards a breakdown, and only by acknowledging it can Kiri hope to live with it, to make it a part of herself. With the weight of the expectations I placed upon its spine after declaring its synopsis to be one of the best I’d ever encountered, Hilary T. Smith’s debut novel WILD AWAKE had a lot to live up to. Fortunately, it was more than up to the task. 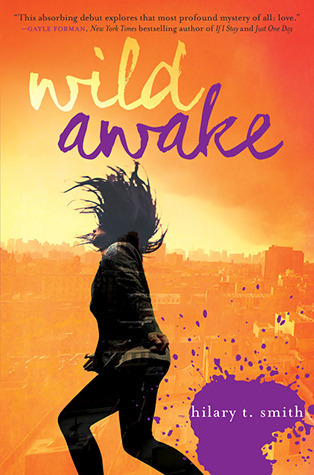 WILD AWAKE reminded me of the best type of our favorite and revered Aussie YA: it’s whimsical and more than a little odd, but ultimately grounded in the solid reality of common emotions. WILD AWAKE has many strengths, one of which is its startling and beautiful prose. It startles you because Smith is, oftentimes, just noting in passing an everyday detail or thought—only she does so in a way that makes you pause and actually notice what you otherwise would not. The prose tinkles like water trickling over crystal. Its brightness combines with the darker undertones of Kiri’s situation for a full symphony of bass emotions and soprano wonder. From the start, Kiri as protagonist stands out. She is many things, has many identities—a serious pianist, a quipper; a dutiful daughter, a monomaniac—but she owns them all unabashedly, deliberately. Unlike other, forgettable YA protagonists who claim to be artists or rebels or whatever, Kiri doesn’t say: she just is, and that makes her being genuine. She’s unafraid to plunge herself into making mistakes, with the result that she gets more out of life than those who hang back. The times when she descends into a whirlwind of monomania are thrilling yet terrifying to read, because you see why she does it, why she needs to let herself go like that, and yet despite how seemingly carefree she is in those moments, you know it’s barely masking a deep, deep hurt. I desperately wish Kiri was real, because I think that her fearlessness, whether or not it’s enviable or reckless, would make me a better person. That being said, in the end, it’s difficult to say what this book is about. The synopsis emphasizes the mysterious circumstances of Kiri’s sister’s death, but besides for being the catalyst for what happens in the book, finding out more about Sukey and what happened to her becomes less and less of a priority as the book flows along, replaced by Kiri’s deterioriating mental state. Which is a fine direction for a story to go, but still, a little…disorienting. Nevertheless, WILD AWAKE was a story that lived up to its promises. It is more than the sum of its parts, more than just delectable prose, sympathetic character, and endearing family mystery. Go in with no anticipation of conventions, and enjoy the wild-awake ride. Cover discussion: LOVE the colors. Not the biggest fan of the double exposure that is reminiscent of photography projects produced by emo/hipster-wannabe college students. e-galley received for review from publisher and Edelweiss. Thank you! Right now I'm staying at the relaxing Charley Johng's Hostel in the oasis town of Dunhuang in Gansu Province, China. It's been raining steadily all day so I've been taking the time to catch up on some stuff online. (I can haz internetz, huzzah!) I came via an overnight sleeper train from Xinjiang Province this morning. (Shall I write a post about sleeper trains in China, hrm?) Xinjiang is a far-flung Chinese province that has more in common with Central Asian and/or Muslim countries than most of Han China. It is colorful and dusty and tasty and delightful. Cloth on display at the Sunday Bazaar in Kashgar, Xinjiang, China. Spices at the Sunday Bazaar in Kashgar. My friend bought a ton of different spices, and after she had paid for her goods, the guy took some more of all the types of spaces she had bought, put them through a grinder so they turned into fine powder, and fashioned the result into three lovely-smelling satchets for my two friends and me. I've fallen in love with this unexpected gift: it makes my clothes and backpack smell nicer after a day of travel, and I've even used it to "sweeten up" funky bathrooms and lockers. I'm in the planning process of starting up a travel blog, which will be more dedicated to travel experiences, tips, destination guides, etc. I'll still post occasionally here about where I am and what I'm doing. If/when I set up the travel blog, I hope you will be willing to check it out! Alright, it's dinnertime. I need to stop sitting on this blog post as I've been doing all afternoon and just post it. As I have some downtime over the next few days (and my hostel has solid Internet!) I will be preparing some posts soon for your perusal. Until next time!